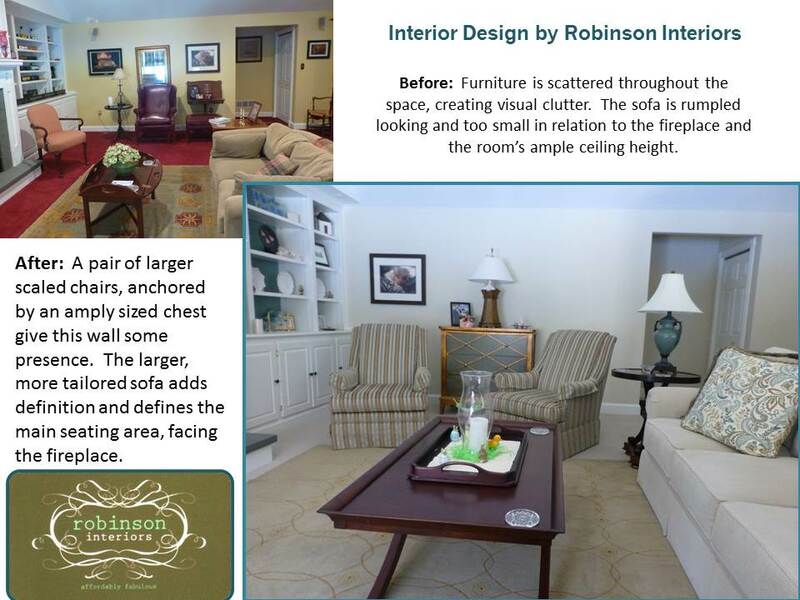 I love to diagnose issues within a space and offer simple suggestions to improve upon my client’s rooms. I really do feel like I can make a positive influence in the everyday lives of my wonderful clients! Hello again! 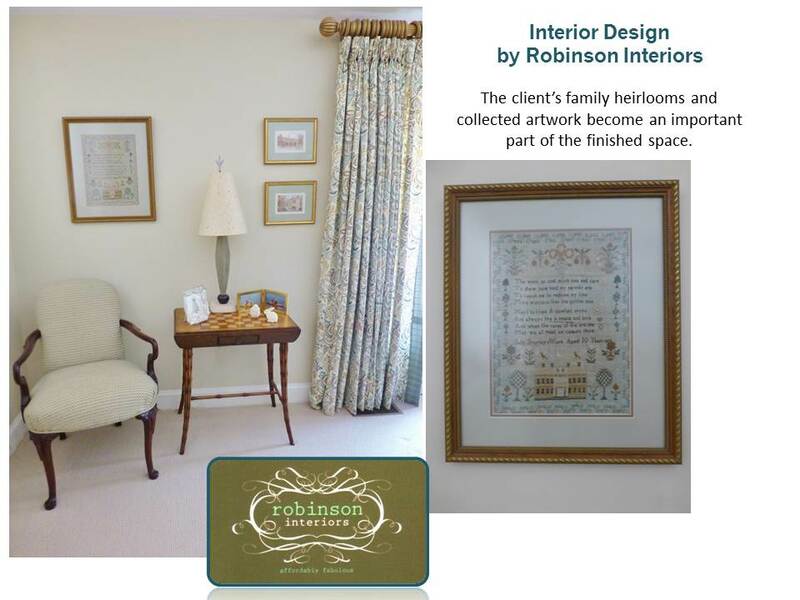 I’m so glad you’re joining me today at Kristine Robinson’s Interiors. This time, I’d like to share a space which I recently helped complete for one of my lovely clients. 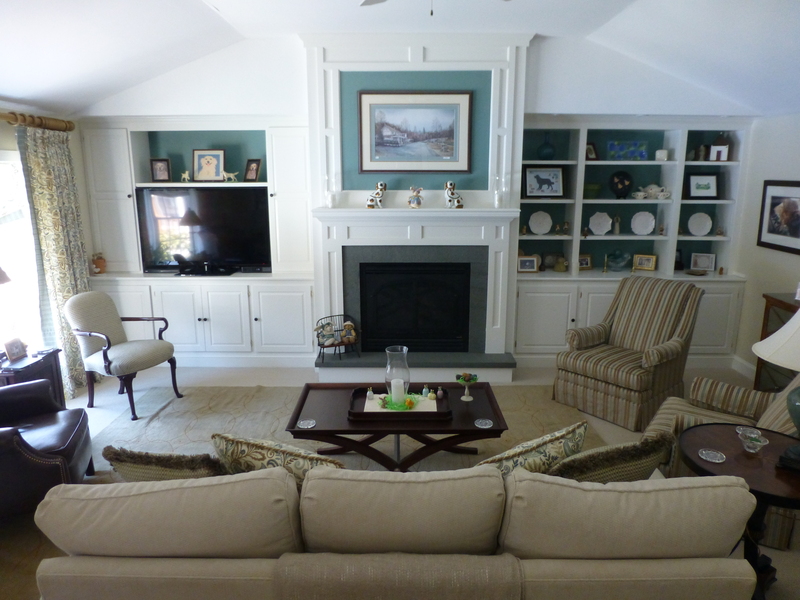 This client originally called me for help with her great room. The space, while quite large, had overpoweringly bold, red carpeting and bright yellow-gold walls. 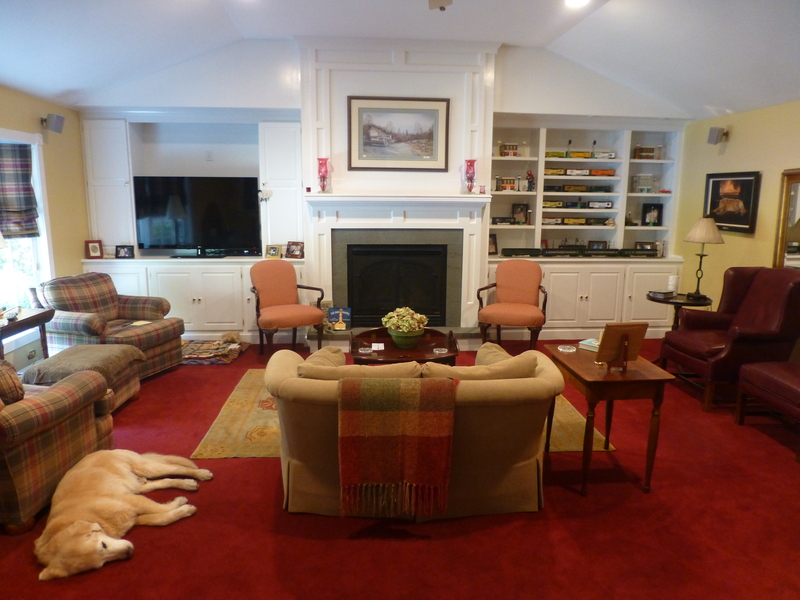 This spacious great room had wonderful lines, with its vaulted ceilings and beautiful built-in cabinetry, but the bold red carpet was overpowering and the yellow-gold walls were in high-contrast. The client had some lovely traditional furniture, but it was starting to look a little tired. The loveseat facing the fireplace was way too small for the extra tall fireplace and it made the whole space feel awkward as a result. This room needed a large anchor in the center and the existing small sofa was not even close to living up to that requirement! In this photograph you can see the fantastic high, angled ceilings in the large space. The furniture placement felt a little jumbled, however, and the red carpet really needed to go! The inside-mounted window treatments didn’t enhance the large bay window at all. Plaid roman shades visually brought the window down and made the whole thing feel very small and heavy. So after making a few suggestions, regarding wall colors, flooring, window treatments, and reupholstery of a few key pieces, I accompanied my client on a furniture shopping trip for a new sofa and some chairs. Following is the result of our efforts. 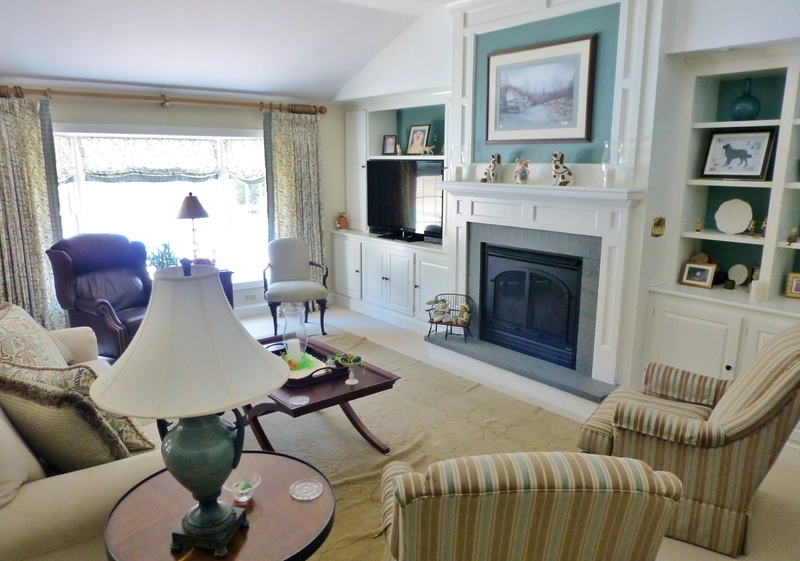 Soothing colors with contrast blue-grey inside the bookcases and above the fireplace mantel create a sense of calm elegance in my client’s great room. What a beautiful and elegant space this turned out to be! 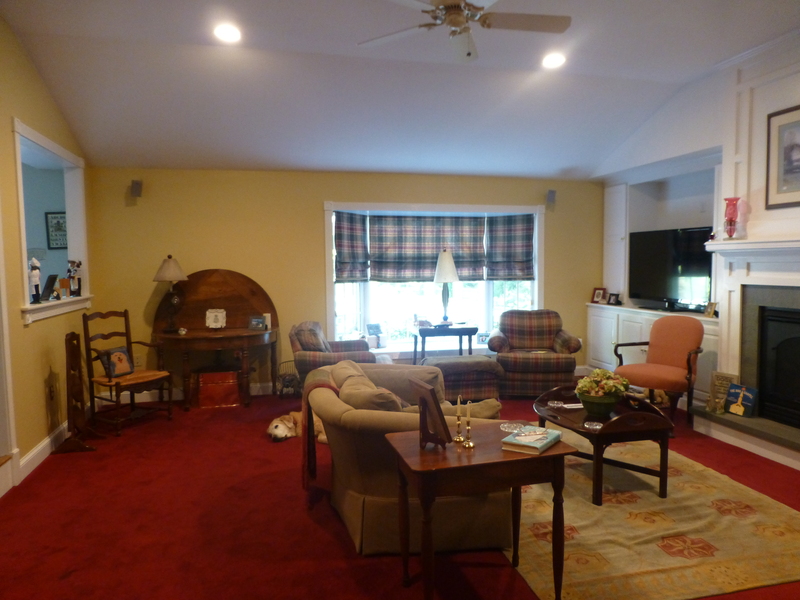 My clients love spending time with their family and friends in this gorgeous and relaxing great room! 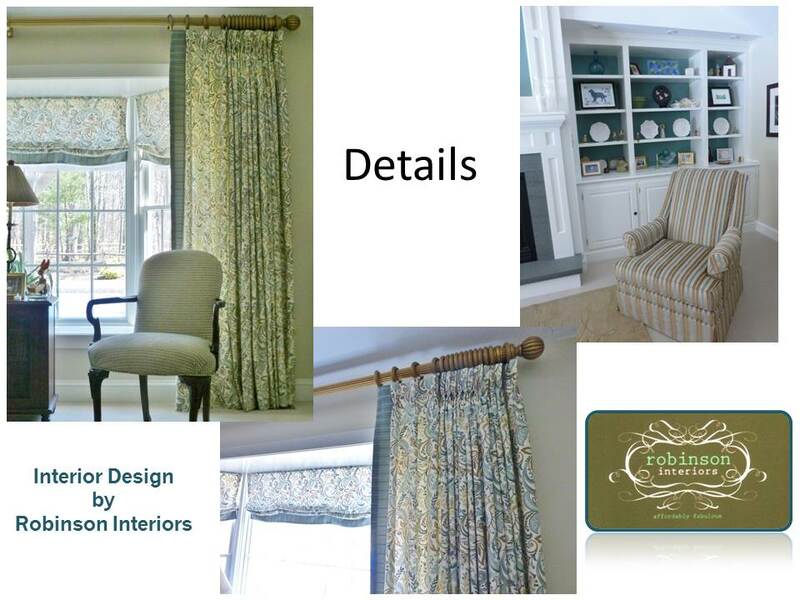 Custom window treatments provide such a wonderful impact on the updated space. Not only do they create the color-story for the room, but they draw the eye upward and visually expand the size & height of the bay window. Making the window appear larger, fixes one of several scale issues within the space and gives the window wall relevance in relation to the tall fireplace. You may also notice that we added a shelf above the television, this helps balance the bookcase on the opposite side of the fireplace. It also allows for some lovely accessory placement and helps keep the television from being so dominant on the left side of the focal wall. 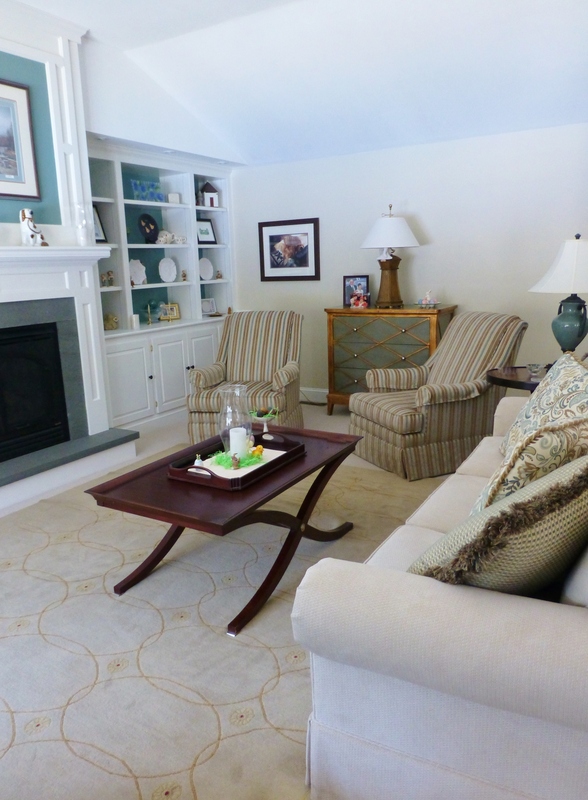 Simple changes in this particular room made a terrific impact, don’t you think? Several key pieces of furniture remained the same and several beautiful new items were added as well. The changes are stunning, aren’t they? 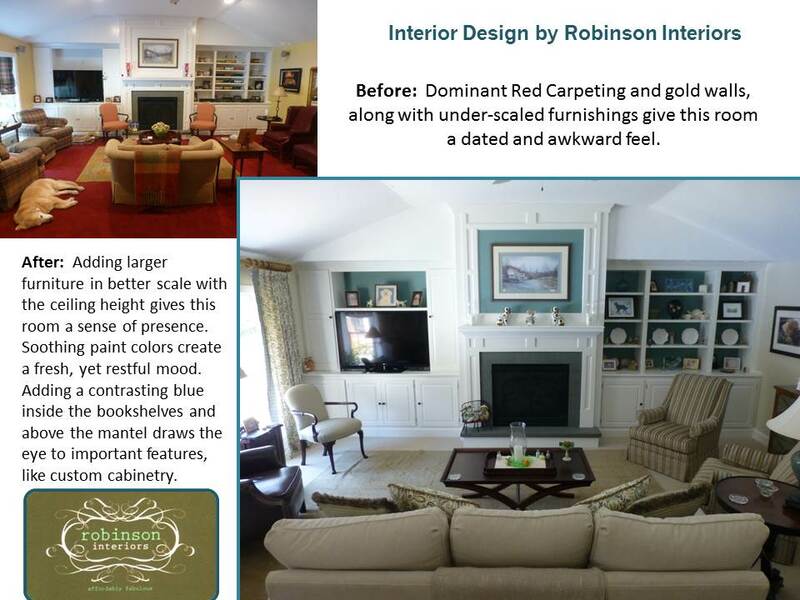 I love to diagnose issues within a space and offer simple suggestions to improve upon my client’s rooms. I really do feel like I can make a positive influence in the everyday lives of my wonderful clients! 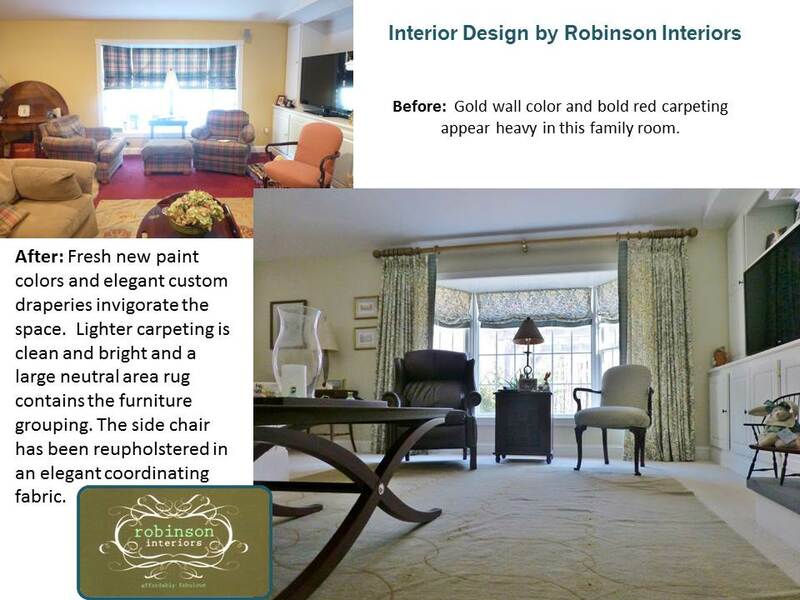 This entry was posted in Before After, Furniture, Home Decor, Interior Design & Decorating, Robinson Interiors and tagged accessories, After, artwork, Before, Color, Decorating, Draperies, Fabric, Great Room, Interior Designer, Kristine Robinson, rugs. Bookmark the permalink.